An international group of scientists, including a researcher from Skoltech, has completed an experimental and theoretical study into the properties displayed by strongly disordered superconductors at very low temperatures. Following a series of experiments, the scientists developed a theory that effectively describes the previously inexplicable anomalies encountered in superconductors. The results of the study were published in Nature Physics. The phenomenon of superconductivity was discovered in 1911 by a group of scientists led by Dutch physicist Heike Kamerlingh Onnes. Superconductivity means complete disappearance of electrical resistance in a material when it is cooled down to a specific temperature, resulting in the magnetic field being forced out from the material. Of particular interest to scientists are strongly disordered superconductors whose atoms do not form crystal lattices. From a practical standpoint, strongly disordered superconductors hold great potential for quantum computer development. At very low temperatures, superconductors display an anomaly which cannot be explained in terms of the classical theory of superconductivity. This anomaly concerns the temperature dependence of the maximal magnetic field that is still consistent with the superconducting behavior of the material. This maximum field, also referred to as the "upper critical" field, always increases as the sample temperature declines, whereas in regular superconductors, it nearly stops growing at temperatures several times lower than the superconducting transition temperature. For example, in the case of amorphous indium oxide films used in this study that become superconducting at 3 K (-270 oC), one would expect the critical magnetic field to stop growing at temperatures below 0.5 K. However, the experiment indicates that the critical field keeps growing even as the temperature drops to the lowest possible values (about 0.05 K in this experiment), and its growth shows no signs of saturation. Scientists from Skoltech, Landau Institute for Theoretical Physics, Institut Néel (France), Weizmann Institute of Science (Israel) and the University of Utah (U.S.) demonstrated that the anomaly is caused by thermal fluctuations of quantum Abrikosov vortices. The magnetic field that penetrates into the disordered superconductor has the form of vortices, i.e. tubes, each carrying magnetic flux equal to the fundamental value hc/2e, where h is the Plank constant, c is the speed of light, and e is the electron charge. At absolute zero, these vortices are immobile and rigidly attached to the atom structure, while any nonzero temperature leads to fluctuations of the vortex tubes around home bases. The strength of these fluctuations grows with temperature, and this results in a decrease in the magnetic field that can be applied to a material without affecting its superconducting properties. "We have developed a theory of the effect of thermal fluctuations of Abrikosov vortices upon the value of the upper critical field, which helped us to establish a relationship between two different types of measurements," says Mikhail Feigelman, principal research scientist at Skoltech and deputy director at Landau institute for Theoretical Physics. Gaining an insight into the behavior of strongly disordered superconductors is essential for their use in superconducting quantum bits—key elements of quantum computers. It became obvious a few years ago that multiple applications in this field require very small elements with high inductance (electric inertia), and the strongly disordered superconductors are the best fit for such "super-inductance" elements. 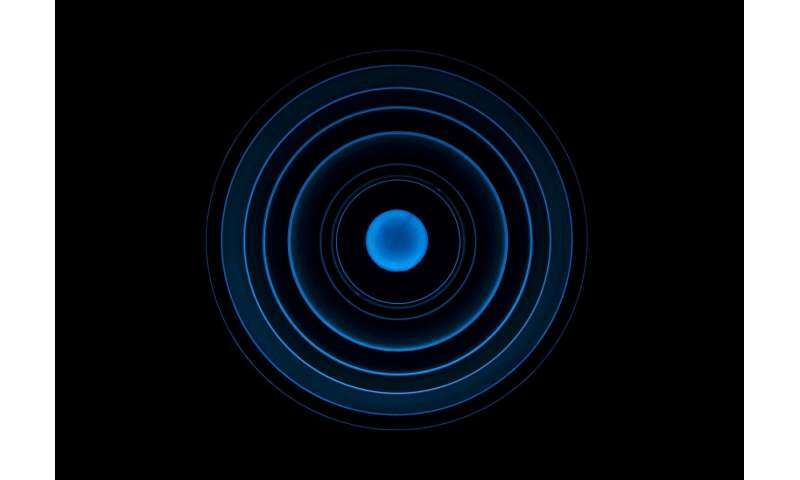 "Understanding of the behavior of these materials will help create superconducting quantum bits highly isolated from external noise," says Feigelman. The magnetic field is due to the changing E field, the temperature is due to the changing E Field. The changing E field is due to the motion of the center of each E field present. The motion of each E field center is due .. did I say this already? Simpler to understand the initial conditions. ID the object w/ a Ping. use a ping you have the ability to Identify; not unknown nonsense. Don't start w/ some fancy theorem; there only exists E field Centers. Better w/ logic and a computer. Theory w/ no axiom, get outa here! Experiment for or after identification. Try experiment for "Identification" using what is known and expected logical response. Then define Theory from ID results, seeking. Since we are smart, we can simulate it and save the boss some money! Oh, I thought they were Logical scientists, not idiots!